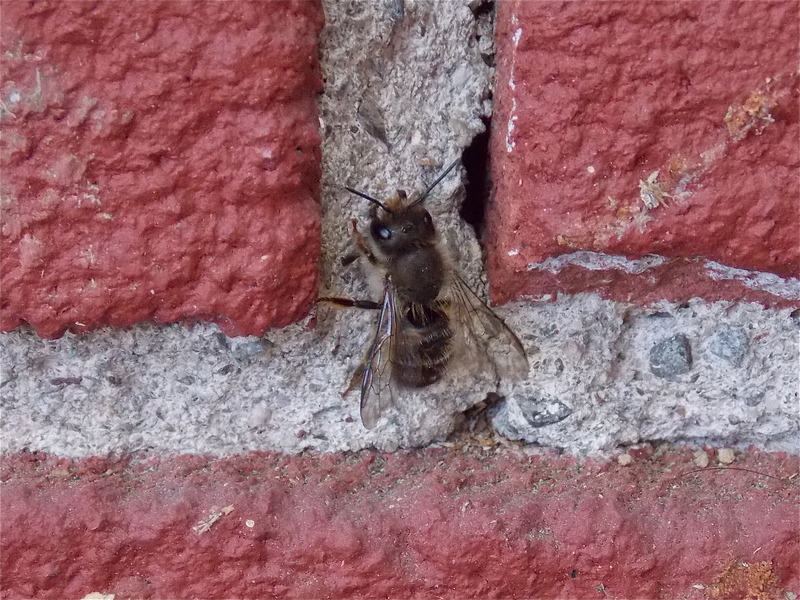 My interest in bees expanded beyond the honeybee, one spring day, thanks to this little gal who was busy going in and out of a hole in the mortar between the bricks. 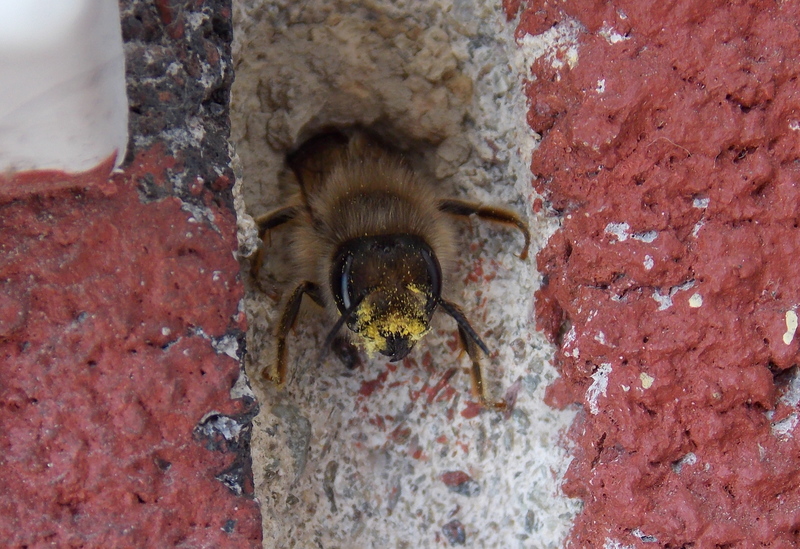 At first, I believed her to be a scout honey bee looking for a new home for a swarming hive and then I looked closer. This busy little bee was about the right size to be a honey bee but in fact was a hornfaced bee, a variety of mason bee. She was using the hole as a nest where she lays about 10 eggs, one each in individual cells that she separates with mud partitions. The larva eat a provision of pollen and nectar (bee bread), defecates and spins a cocoon. In the fall, they molt into pupae and then adults where they remain dormant throughout the winter, waiting to emerge in the first warm days of spring. The life cycle of the mason bee is the life cycle of most solitary bees where all females lay eggs and produce a new generation. The only real commonality between the honey bee and the hornfaced bee, beyond being bees, is the fact that they are both introduced non-native species. This mason bee is native to Japan and was brought to the United States in the 1960’s for the pollination of fruit trees in Utah where they did not survive. Later in 1976 they were imported into Maryland and prospered in a climate that was similar to their native home. As it so happens, they also do well in the Hudson Valley and find my brick house a perfect habitat. Look for its native counterpart the blue orchard bee whose blue green body can’t be confused with a dark body covered in yellowish hairs and striped abdomen of the hornfaced bee. These bees are pollination superheroes, for example, to pollinate a one acre apple orchard you would need 600 hornfaced bees or 250 blue orchard or 20,000 (one to two hives) of honeybees or more! An individual hornfaced bee is 80 times more effective than an individual honey bee for pollination of apples. The orchard bees are active in April and May when the flowers of the apple tree and other fruit trees are in bloom.